Fish sauce (nuoc mam) is a staple ingredient in Vietnamese cuisine. It is a condiment made from fermented anchovies. In terms of taste, it has a salty and umami flavor with a pleasantly strong smell. In terms of appearance, fish sauce is a transparent deep amber liquid. Fish sauce can be added to marinade or during cooking. In addition, it can be used as a dipping sauce, either directly or mixed with other ingredients such as lime juice, vinegar and sugar. Generally speaking, we add fish sauce to everything (except dessert) in Vietnamese cooking. Personally, I don’t use fish sauce to marinate beef because I find that it makes the beef tough and sour. Therefore, I only add fish sauce during cooking the beef. Fish sauce is sold at all Asian grocery stores. I also see it being sold at some regular Western grocery stores. When choosing fish sauce, you should choose the one with only anchovies extract and salt as the main ingredients. I do not recommend buying fish sauce containing other ingredients such as sugar and MSG. 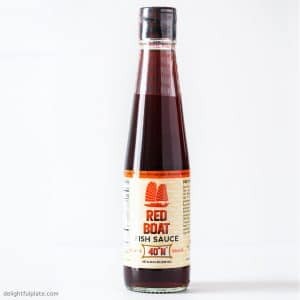 My favorite fish sauce brand is Red Boat. You can buy it on their website or Amazon.com. Some local Asian and Western grocery stores may carry it. It is also available at Costco, Whole Foods and Trader’s Joe. The price is higher than other brands but the superior taste and smell does justify the price tag, in my opinion. We were fortunate to have visited Red Boat factory in Phu Quoc, Vietnam and they have very clean facilities and strict quality controls there. You can read about our visit to Red Boat fish sauce factory here. I usually buy Red Boat bottles from Amazon and I have never had any issues with the packaging. Disclosure: Delightful Plate is a participant in the Amazon Services LLC Associates Program, an affiliate advertising program designed to provide a means for sites to earn advertising fees by advertising and linking to Amazon.com. As an associate, we earn a small commission for qualifying purchases at no extra cost to you. We only recommend products that we trust.